If you work with enough companies in manufacturing and industrial distribution, you start to see a trend. A big focus for these companies is verifying what happens at the dealer and contractor level. How are you going to provide effective channel marketing if your marketing data is insufficient? What is going to inspire dealers to consistently give you that data? Once you have that data, are you going to have what it takes to create long lasting B2B customer loyalty? Or are you going to let your channel marketing efforts go to waste and head back to the drawing board for lead generation? 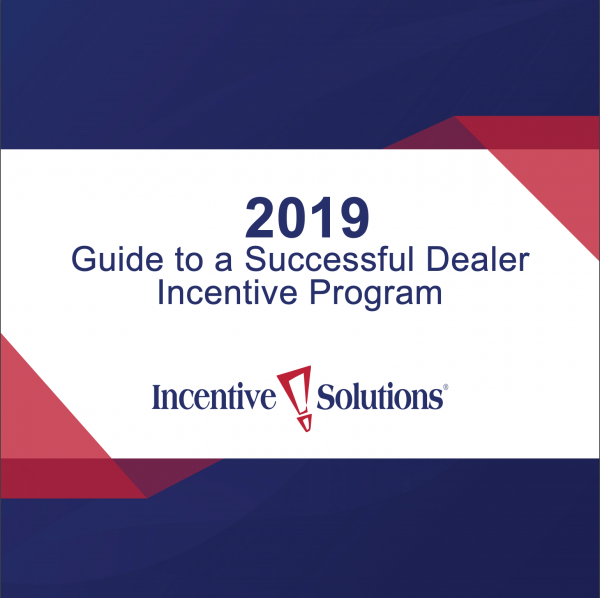 Based on one of our most popular blog posts of all time, Incentive Solutions is pleased to announce our new e-book, A Guide to a Successful Dealer Incentive Program. Building personalized relationships and B2B customer loyalty that will allow your business to penetrate new verticals and to compete with changing distribution channels and online retailers. A Guide to a Successful Dealer Incentive Program offers a step-by-step guide for structuring your dealer incentives program. From selecting the right KPIs and rewards, to budgeting, to effectively engaging dealers throughout your distribution channel and measuring ROI. Interested in a dealer incentive program? Increase mindshare—Lacking personal relationships or brand investment, contractors and dealers tend to focus on costs. Monetary costs, as in, “How can I minimize overhead and maximize profit?” Time costs, as in, “How quickly and easily available is a given product?” And reputational costs, as in, “Given those two factors, what can I recommend that I know the end user will be happy with?”That said, a lot of the time dealers are stuck in their ways. Dealer incentives programs can be used to educate dealers on the benefit of new product lines. One of our clients in industrial manufacturing realized a 307 % return on investment by incentivizing dealers and contractors to focus on a new product line. Compete with lowballing competitors—With e-commerce and globalization, sometimes it can feel like a race to the bottom when it comes to price. This is a frustration for companies across various industries. Building materials manufacturers, plumbing and electrical distributors, heavy equipment manufacturers, have trouble matching the prices of their offshore competitors.However, dealer incentives programs can be used to outsmart the low-budget competition. One of our clients increased their sales 15% over two years—without dropping their price! Reduce “cost to serve” & jumpstart e-commerce platforms—Earlier I mentioned how dealers stick to what they know. That includes their purchasing habits. As wholesalers and distributors have began making an effort towards digitalization, many dealers and contractors have been slow to keep up.A wholesaler we worked with was able to incentivize their dealers and contractors to shop online, saving a whole lot of manhours and logistical difficulties on their end. Over 77% of their target audience participated. Average online order quantity increased 319%. Revenue from dealers and contractors in their program increased 665%. If those numbers don’t get you excited, I’m not sure what will. A Guide to a Successful Dealer Incentive Program is available for free. You can download your copy here.